Our strategies cover major asset classes. At Bireme, we have proprietary investment strategies which provide exposure to US equities, international equities, US fixed income, and alternative assets. They are a mix of both qualitative and quantitative investing styles. Each strategy seeks to outperform its respective benchmark, leaving our clients better off than if they had just accepted the return of the index after fees. Our clients get the combination of strategies that's right for them. This depends on their investment philosophy, financial situation, and risk tolerance, as well as the prevailing market conditions. For more on our process, see here. Fundamental Value (FV) is our flagship US equity strategy. FV's benchmark is the SPDR S&P 500 ETF Trust (SPY), which seeks to track the investment results of an index composed of the 500 largest public companies in the US. FV generally owns about 15 stocks that are each roughly 5-10% of a client's investment in the strategy. We think this is the optimal level of diversification. It allows the concentration necessary for outperformance, but also maintains small enough positions that the portfolio is less exposed to adverse developments in any one company. FV is based on a Benjamin Graham-style, value-investing philosophy. A value strategy tends to buy companies which have a market price that is inexpensive compared to current and near-term earnings. Contrast this with growth, which tends to buy high-flying, fast-growing stocks in the hopes that they will eventually generate enough future profits to justify today's price. Value investing based on trailing financial statement data has been shown to outperform historically. This chart1 compares the hypothetical performance of starting investments of $100 in value (cheap relative to book value) stocks and in growth (expensive relative to book value) stocks since 1926. Growth left an investor with a portfolio worth a seemingly impressive $280,711. Yet value outperformed growth by more than 24 times, resulting in a portfolio worth $6,857,077. We expect our clients to benefit from this value effect, as well as our stock- picking skills, going forward. Global Relative Value (GRV) is our international equity strategy. GRV's benchmark is the iShares MSCI All World Ex US ETF (ACWX), which seeks to track the investment results of an index composed of large- and mid-capitalization non-US equities. GRV provides an important diversification benefit to our clients by giving them exposure to other economies and currencies. Global Relative Value takes our value investing approach from Fundamental Value and applies it to countries as a whole instead of individual stocks. Valuations differ across countries, just like they do across stocks. A country's stock market, taken as a whole, can be cheap or expensive relative to the cash flows of the underlying companies. GRV takes a quantitative approach to country allocations. Our algorithms look at various economic factors, including currency valuation, earnings, dividend yields, interest rates and inflation. Using this data, we estimate returns over the next five to ten years for approximately 30 equity markets around the world. Using ETFs, we buy the countries we feel have the most attractive investment prosects. (GRV does not take short positions.) We own no less than 10 country ETFs at a time. To maximize risk relative to return and optimally diversify the portfolio, we use a modified version of Modern Portfolio Theory2. We also limit other risks. For example, we limit exposure to any individual country and the total allocation to riskier emerging markets. Studies show substantial returns are available to this kind of country rotation. One study3 used a very simple statistic (smoothed trailing earnings) to determine valuation, and still found a 14.4% annual difference in return between the cheapest and most expensive global markets. In Global Relative Value, we aim to capture some of this spread and outperform a naive approach that invests in every country without regard to investment prospects. Fixed Income Sector Selection (FISS) is our US bond strategy. FISS's benchmark is the iShares Barclays Aggregate Bond Fund ETF (AGG), which seeks to track the investment results of an index composed of the total US investment-grade bond market. An allocation to bonds is appropriate for many investors. Bonds are low risk, low return investments that offer some diversification benefit vs a stock-only portfolio. However, active bond management is not worth the higher fees. From 1998-2012, active bond managers underperformed in 11 out of 15 years while taking on more credit risk than their underlying indices3. Therefore, for FISS, we don’t evaluate individual credits. We think its best to get our clients the lowest-cost exposure to the most attractive fixed income sectors. To do this, we algorithmically analyze the bond market. We project returns across the duration and credit risk spectrums. Then we look to buy ETFs which correspond to those attractive sectors. Interest rate and credit risk environments change slowly, and thus we expect FISS to hold positions for years at a time. By avoiding areas that are relatively expensive, we try to improve on the returns clients would generate by just buying and holding all bonds regardless of their relative valuation. Alternative assets are assets that have not traditionally been considered part of a normal investment portolio. This includes real estate, commodities (e.g., oil, gold, or corn), art and rare coins, as well as private equity, venture capital, and hedge funds. Alternative assets promise a positive investment return that is somewhat uncorrelated with the economy, and equity and bond markets. This concept can be attractive to investors, as asset that could deliver on these promises would greatly reduce the overall risk of a portfolio. Bireme has two proprietary, algorithmic, market-neutral strategies that we hope can fulfill the alternative asset promise of a positive, uncorrelated return stream. Why don't we use typical alternative assets? Why not just recommend our clients own real estate, or commodities? Unfortunately, we think there are significant problems with many alternatives. Low liquidity. Many alternatives suffer from low liquidity. Low liquidity is a danger because it can leave investors without access to their money should they need it. Furthermore, illiquid assets can have high transaction fees, reducing the take-home returns of investors. Low liquidity also makes assets difficult to value, leaving holders unsure of the value of their portfolio. Volatile. Some alternatives have been volatile. Oil has had two 75% drawdowns in the decade between 2006 and 2016. It was long considered that a home was a nearly infallible investment that could avoid the drawdowns common to stocks and bonds. Yet home prices saw a 36% drop during the housing bust4. Correlation. The main attraction of alternatives is their diversification value. Yet many alternatives have had a disappointingly high correlation to the equity market. Real estate didn't provide much diversification during the Great Financial Crisis when both equity and real estate prices plunged simultaneously. And as investors pile into alternatives, correlations go up. Commodities, which had a correlation of around 20% with other asset prices in the 1980s and 1990s, have a 60% correlation today5. Low returns. Most damning, many alternative assets have not delivered a significant positive long-term return to their owners. It doesn't matter how much diversification an asset provides if it doesn't make its holders any money. 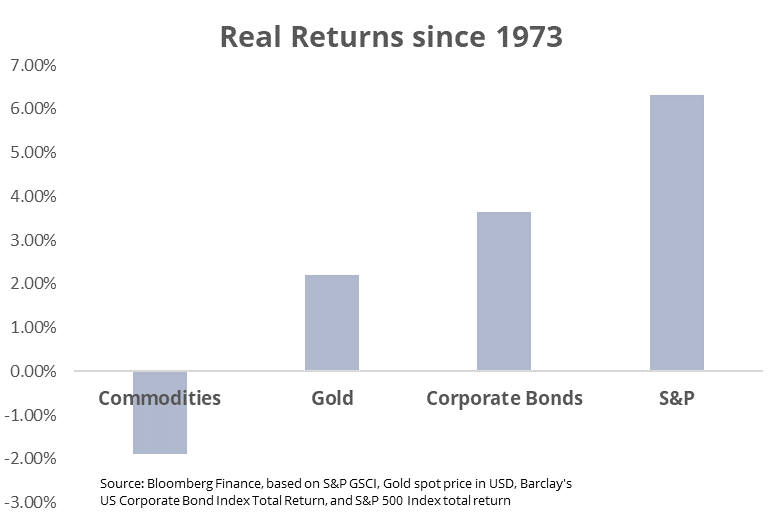 The chart below shows the value of an investment in stocks, bonds, gold, and commodities since 1973. Can investors achieve the desired diversification yet manage to avoid these substantial issues? Bireme offers two proprietary, market-neutral strategies that we hope can deliver on the promise of alternative assets. These strategies are designed to have no long-term correlation with the stock market. In addition, the strategies should have no correlation with each other, as they are profoundly different investing approaches and take different routes to market neutrality. We believe both have the potential for positive long-term returns while avoiding the common drawbacks listed above. By using only publicly-listed equities, we're able to preserve liquidity for investors should they need it. High liquidity keeps transaction costs down, and means our strategies are constantly being valued by the public market, reducing valuation uncertainty. Finally, we expect these strategies will have lower volatility than an alternative like oil with its wild price swings. Quantitative Index Investing (QII) is one of our market-neutral strategies. QII's benchmark is the Hedge Fund Research Institute's HFRX Equity Market Neutral Index (HFRXEMNI), an index of investable, equity market-neutral hedge funds. QII is an algorithmic approach to trading the S&P 500. Throughout the trading day, we analyze 20+ indicators of market direction. Each indicator is based on an underlying causal relationship behind market movements. Some of the data series we analyze include interest rates, credit spreads, investor sentiment, relative industry performance, market breadth, volume, option trades, and economic news. These indicators, when combined together, portend a positive, negative, or neutral outcome for the S&P in the short term. Using that prediction, we invest in the S&P 500 only on the ~33% of days when it is statistically likely that the market will increase in value. On days when we don't have a strong opinion on market direction, it is better to play it safe and hold cash, which is less volatile than equities and still earns some interest. And rather than stay invested and lose money on days when the market is likely to be down, we try to profit from those downturns. QII attains market neutrality by alternating long and short positions. Because QII might be either long or short the market on any given day, QII is correlated with equities over short-term time frames. However, because it switches positions rapidly, there is negligible correlation with the market over time frames of greater than a few months. We think this makes QII a great alternative asset solution for our clients. Quantitative Market Neutral (QMN) is our second market-neutral strategy. Like QII, QMN's benchmark is the HFRX Equity Market Neutral Index. QMN takes an algorithmic approach to company valuation. With QMN, we distilled our qualitative value investing process into an algorithm. We run a full discounted cash flow model on a large portion of the investable US equity universe (about 1500 stocks). Using historical financial statements, industry peers, and other data, QMN's algorithms learn about a company like a human stock analyst would. Then QMN uses a combination of hard-coded financial logic and machine learning to transform this knowledge into predictions about the company's future financials (sales, costs, debt, etc.). Finally, QMN uses these predictions to compare likely future cash flows to current stock prices, and buys the cheapest stocks and sells the most expensive. QMN attains market neutrality by holding long and short positions of equal value. Rather than make money on market movements, QMN makes money on the return differential between the stocks it bets on and the stocks it bets against. QMN rebalances monthly to take advantage of quickly shifting conditions in the marketplace. For risk controls, QMN maintains loose sector neutrality to limit exposure to any one industry, and keeps positions sizes in the 1-2% range to minimize the risk from any one stock. Algorithmic valuation comes with some benefits over qualitative valuation. The most important benefit is that algorithms avoid the biases that cloud investor decision-making and cost them money. Algorithms are inherently dispassionate and don't make the emotionally-driven mistakes that haunt investors7. Also, because algorithms work so much faster than humans, QMN can look at every investable stock in the US equity universe, an impossibility for any analyst or even team of analysts. We think QMN is a step above what some other algorithmic investors are doing. Today's financial academic literature tends to have a focus on what are called "factors." A factor is a single statistic that is meant to sorts stocks into those that will outperform and those that will underperform. Canonical examples include size (smaller companies outperform), value (low book-to-value companies outperform) and low volatility (low volatility stocks outperform). In recent years, factor investing has been all the rage, marketed under names like "smart beta." But our view is that the factor approach falls short of valuing stocks like a human analyst would do. While we look at all the data available and analyze it in a systematic way, a factor is merely a single, simple statistic that could never contain all the relevant information about a company. We also worry that the historical outperformance of many factors might be artifacts of data mining, rather than an actual source of alpha; there's no obvious economic causality, or rhyme or reason, why many factors outperform. Further, even if a given factor was indeed a source of alpha historically, that outperformance might be arbitraged away as investors invest in vehicles which seek to profit from it. We think our discounted cash flow approach is more sophisticated, and more promising, than the common factor approach to algorithmic stock selection. ​1 Monthly compounded returns from the top and bottom quintiles of the "Portfolios Formed on Book-to-Market" data from Kenneth R. French's data library. 3 Cambria Quantitative Research study. 5 Maximum post-2008 peak-to-trough drawdown in the Real Home Price Index from Robert Shiller's US Home Prices 1890-Present. 6 See Betterment's "The Case Against Commodities" citing data from Jeremy Seigel's "Stocks For the Long Run". 7 Chart by Bireme. Data from David Jacks's paper "From Boom to Bust: A Typology of Real Commodity Prices in the Long Run" (NBER Working Paper 18874). 8 Some examples here and here.